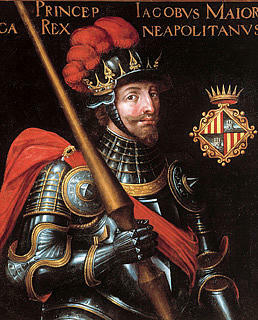 Jaime IV the Rush, the Unfortunate Aragon de Mallorca, King claimant of Mallorca, King consort of Naples, was born circa 1336 to Jaime III de Mallorca (1315-1349) and Constance of Aragon (1318-1346) and died 20 January 1375 in Soria, Spain of unspecified causes. He married Joanna of Naples (1328-1382) 26 September 1363 JL in Castel Nuovo, Naples, Italy. Notable ancestors include Charlemagne (747-814), Alfred the Great (849-899), Henry II of England (1133-1189), William I of England (1027-1087), Hugh Capet (c940-996). Ancestors are from Italy, Hungary, France, the United Kingdom, Spain, Germany, Russia, Ukraine, Belgium, the Netherlands, the Byzantine Empire, Sweden, Belarus.